Sean Kanan has many fans as Deacon Sharpe on The Bold and the Beautiful, thanks to his skillful acting. However, Kanan is a successful comedian as well! 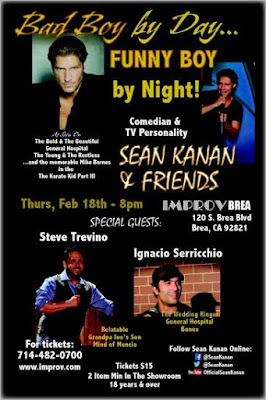 Kanan is appearing in a comedy show on February 18 at 8pm in Brea, CA with special guests Steve Trevino and Ignacio Serricchio (The Young and the Restless). For tickets, please call 714-482-0700 or visit www.improv.com It is sure to be a great time!